This option extends Concept systems for temperature dependent dielectric and impedance spectroscopy with frequency range < 10 MHz to microwave frequencies up to 3 GHz. The RF extension includes the RF sample cell BDS 2200, RF extension line, BDS 2300 mounting rack and an RF impedance analyzer Keysight E4991B-300. 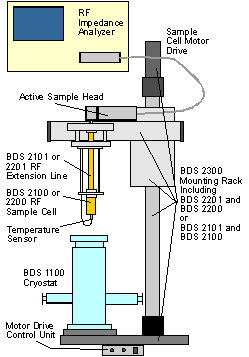 The sample is mounted in parallel plate arrangement between two RF external electrodes which are mounted in the RF sample cell. 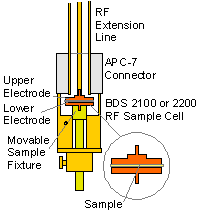 The RF cell is thermally isolated by the RF extension line which connects the RF cell to the impedance port of the RF analyzer. As this setup is very sensitive to mechanical stress, it is supported by the motor driven BDS 2300 mounting rack which allows to move the sample cell in and out of the cryostat by special mechanics avoiding mechanical forces on the extension line and APC-7 port connections. 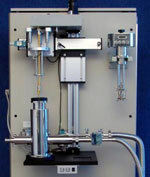 Mounting rack with extension line and sample cell, mounted to Quatro Cryosystem. Mounting rack with extension line and sample cell, detailed view.